Excellent lens, very light weight and fast enough to work in low light. A must to have. I bought this lens as my first prime. I've had some great results from it so far. Ideal for portrait photography. Considering it's F1.8, the quality is fantastic. I agree the build does feel rather light and plastic which can be off-putting. But the lens delivers quality and performance. The f1.4 can cost 4 times as much, and for what? For the general photographer, this is a vital piece of kit. great value high performance lens. must buy! I love this lens! The first copy I borrowed from a neighbor years ago was somewhat strange, but I needed something in the 50 range, I tried three 1.4 versions and none focused correctly or were sharp wide open. I shoot indoors without flash with this lens all the time so I need it somewhat sharp wide open. I got this one used form b&h and it is awesome! Sharp, fast focusing, nice and small, easy to carry to gigs with two other lenses. I don't think this lens will easily break on me and I use it kind of roughly (meaning at gigs my three lens go in and out of my bag without caps and never get damaged.) The camera and lens gets put on the ground, is out in light snow and rain and is still kickin' after a year of my use and who knows how long of someone elses. I'd never go to the 1.4 after using this lens! One of the best bargains out there - fantastic little lens for practically nothing !! For a poor college student this lens was perfect. I was hesitant at first but it was so cheap I couldn't resist. Since getting it I have not had a single complaint. I love this lens. 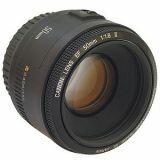 Great lens just bought one I am impressed seems more clear than costly lenses although it is only 50mm.. But still good for portraits. excellent deal! A great standard lens. With the addition of the EF12 and EF25 extension tubes you can cover a full magnification range up to 1:1 in the three combinations. Auto focus hunts though with both extension tubes on together and its best to go manual. The 50mm/f1.4 and 50mm/f1.8 are the BEST PORTRAIT LENSES that Canon offers. I own a Canon Rebel 2000 and Digital Rebel XT and have used both these lenses for several months. Pictures have been outstanding and my professional customers frequently cite the sharpness, light balance, depth of field, color reproduction, and "bokeh" (intentional blurring of background in portraits) from these lenses. Some people question the usefulness of a 50mm lens on digital SLRs with a 1.6x crop factor (i.e., 50mm lens = 80mm on a dSLR like the Digital Rebel XT)... I can vouch that the range is beautiful and relevant, focusing more closely on key subjects in portraits. WHAT DO THESE LENSES HAVE IN COMMON? They are both fast (the f1.4 is blazing fast - dSLR can hardly keep up! ), details are incredibly sharp (you can see individual hair strands), virtually no chromatic (color) aberration, no dithering or shadows in the corners, focusing is rapid and quiet (thanks to Canon's patented Ultrasonic USM technology) and photo quality parallels even my professional Canon "L" lenses. These fixed aperture lenses also provide superior pictures than telephoto lenses at 50mm because of better glass and aspherical elements. HOW ARE THESE LENSES DIFFERENT? Having tested both lenses across 1500+ pictures, there are 5 key factors that make the f1.4 superior (justifying the $300+ price tag). I love this inexpensive lens. Is a great friend of my eyes. I have many images i take whit this lens in my gallery.